Here at the farm, even though it is almost mid March, we are long on 2010 potatoes. I grow potatoes the lazy woman’s way… in hay. This past season was the proverbial bumper crop. I told the Husband Tipster that we would have to eat more potatoes to use up last season’s crop. Well…I hate to admit it, as much as I love the spud, after seven days of potato creations I was longing for something different. However, the following is not “something different” but rather a different potato dish. Potatoes can be prepared by almost every vegetable technique. They can be made into gratins, sautés, and soufflés. They can be chipped, baked or boiled. The can be riced, diced and mashed. hey can be roasted, grilled and deep fried. What a useful vegetable is the humble potato. The following recipe is a variation of a recipe by Faye Levy. 1. Trim and discard root and top of leek, leaving white part and 2 inches of green. Slit leek lengthwise leaving a small section in the centre uncut to keep the leek in one piece. Rinse in cold water, separating pieces to remove all dirt. 2. 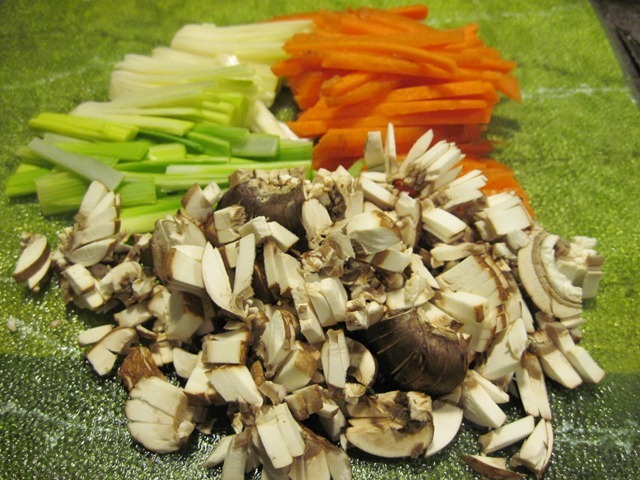 Cut leek, carrot and celery into thin julienne about 2 inches long. Slice mushroom caps crosswise and into rounds. Cut rounds into thin strips. 3. 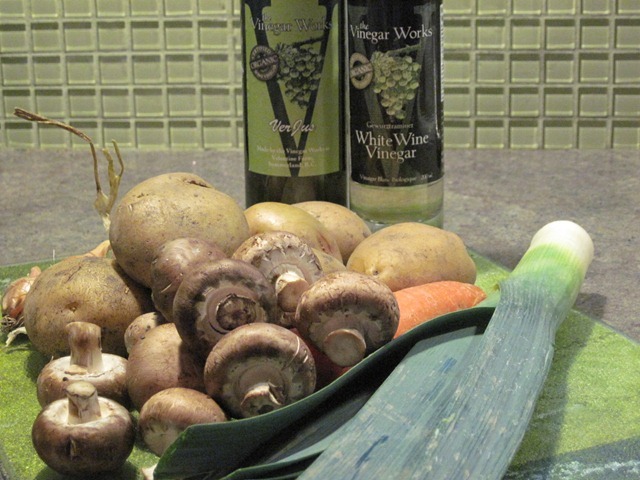 To make sauce combine verjus, vinegar and shallots in a medium saucepan and bring to a simmer over medium heat. Simmer until reduced to about 2 tablespoons being careful not to burn. Add mushrooms, pinch salt and pepper and bring to a boil. 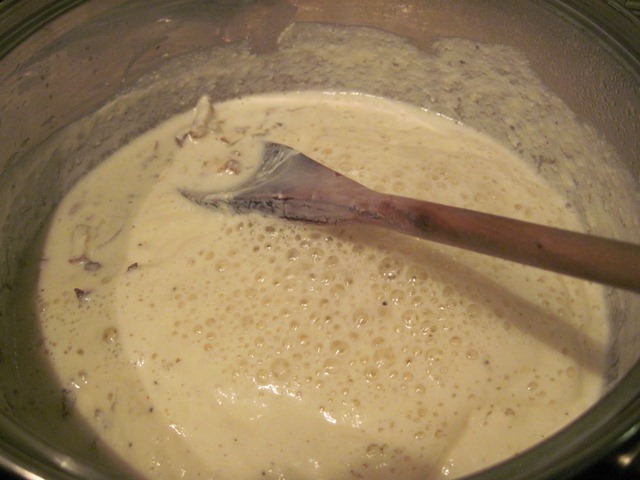 Stir in cream, reduce heat to medium, and simmer stirring for 6 minutes or until mushrooms are tender and sauce has thickened. Remove from heat and set aside. 4. Scrub potatoes, cut in halves or quarters and put into a large saucepan. Cover with water by 1/2 inch and add some salt. Bring to a boil, cover, reduce heat to low and simmer about 15 minutes or until a knife pierces centre easily. Do not overcook potatoes. Drain thoroughly. 5. While potatoes are cooking, bring a large sauce pan filled with water to a boil. 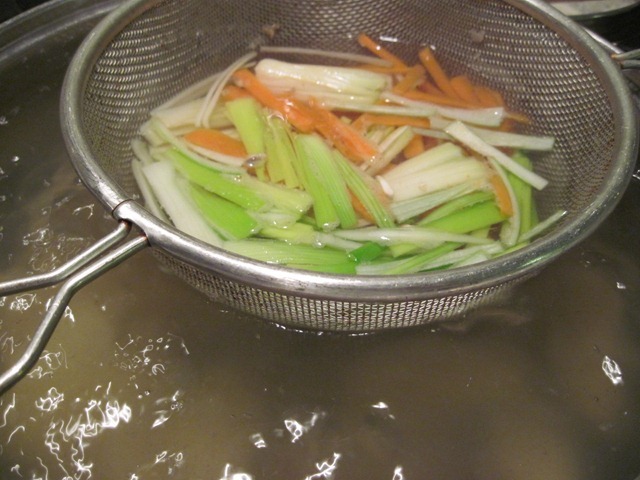 Add carrot, leek and celery and boil for 3 minutes. Drain well. 6. 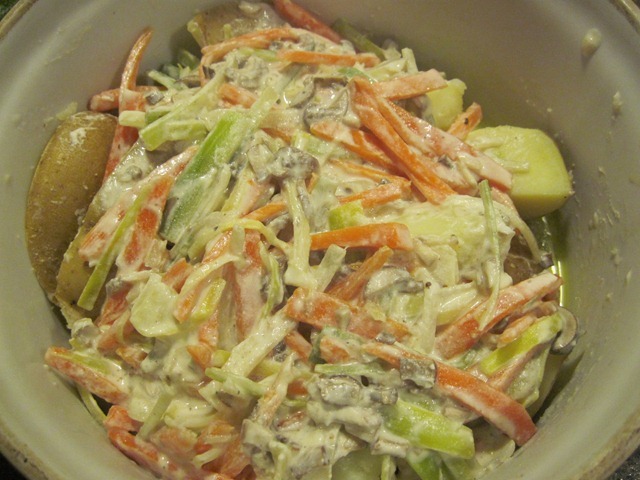 Just before serving, reheat sauce, stir in vegetable julienne and simmer until just heated being careful not to curdle the cream. Remove from heat. Salt and pepper to taste. 7. Pour sauce over potatoes, sprinkle with parsley. Serve as a vegetarian entre or as a side dish. Who says potato salad is just for summer eating?